Boucheron introduced high-level Gaité Parisienne jewelry series, with magnificent life in Paris for the design inspiration, depicts the 19th century so-called "Belle Epoque" the women, on behalf of places, symbol and the emblem and so forth. This series high-level jewelry boutique a total of seven groups, each group are named with a woman, each woman's personality style jewelry styles are the respective source of the creative catalyst. Of course, it is just the starting point of those extraordinary performance high-level jewelry charm of this named , because every one is praise for Paris, which is the praise of the colorful lush of every aspect of life in Paris. 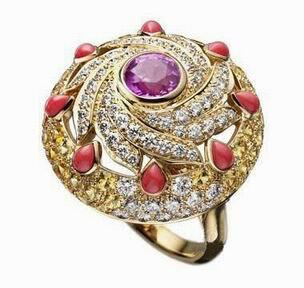 By two ruby and pink sapphire and violet gemstones component. Flowers in full bloom during staggered in clusters is both top-precious stones, including a 5.01 karats oval pink sapphire, and a 4.30 karats of the oval-shaped pink sapphire, which are embedded in nature itself to the abstract style of design. 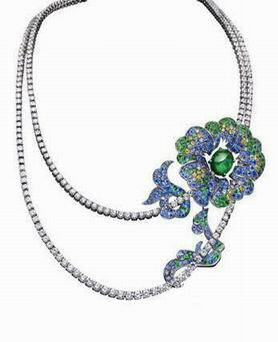 In the center of this necklace is hung a large colorful flower clusters, the leaves inlaid emerald and diamond winding down the necklace, brighter color, flow like waves. 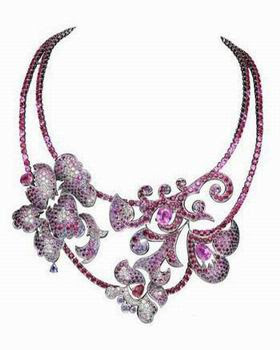 Petals of flower clusters from the shallow to deep color: bright red ruby, pink sapphire, purple and dark blue sapphire, ends a 25 karats of long-horned ladder cut blue sapphire. 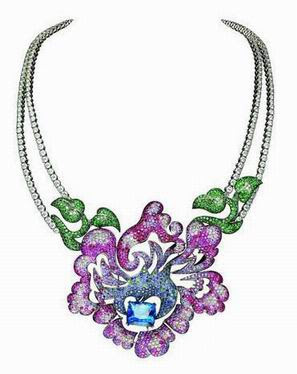 This glitzy necklace sapphire is in the center of necklace, so that extremely luxurious beauty is even more harmonious. Jeanne jewelry suite includes two pairs of earrings, one large ring, one bracelet watch inlaid precious stones, and one luxurious necklace. The components of Jeanne necklace is Baba rum cake, fruit, cream pie, black forest cake, from ruby, sapphire, coral modulation, at the top of necklace have one diamond as whipped cream. Rings, watches and earrings are also overflowing pastry gem bright colors, wrist watches are cleverly hidden in a beautiful cake below. The jewelry was inspired by Lucieémilie Delabigne (also known as Valtesse de La Bigne), Lucieémilie Delabigne is the hetaera in the early 20th century Paris, also she is the well-known contemporary artists muse goddess, one of the most famous writer are Zola, he famous novel "Nana" book have description on this amazing woman. Browse diamond couple rings online at Rockrush.com. Why LV film so love lying posture? How to appreciation Jewelry by yourself ?